All equipment for privates can be combined or done individually. This class uses resistance to help create long, lean muscles. Come work on balance and toning in a supported environment using advanced equipment and formats. 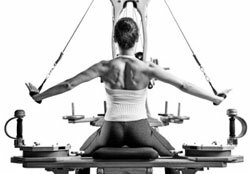 We combine this apparatus in our reformer classes as well as teach it separately. The equipment we use is a unique blend of body weight, pulleys and springs to create resistance. Sometimes we enhance this workout with smaller equipment such as magic circles, light weights and therabands. All classes are non-impact and weight bearing. Training on Power Plate® equipment provides benefits far beyond those of any other type of training modality. Power Plate® acceleration training creates muscle contractions to give you a deeper, more intensive workout, helping to transform the body. These vibrations stimulate muscle strength and flexibility, improve blood circulation, increase bone density, and boost metabolism, which helps burn calories and create a lean, toned and firmer body. Gently using breath work, flow and pace, this workout takes the joints and muscles through rhythmic and undulating motions. The results are highly known for their profound benefits and deep sense of well being. It also is weight bearing and low impact resistance training. Wonderful for rehabilitation work from chronic pain and injury. Check out video resources click here. A gentle therapy that calms the nervous system and increases circulation, creating many health benefits. With it’s marvelous abilities to relieve pain and tension, speed healing and increase your energy and vitality. A perfect blend for optimal well-being. In the event one person is registered, an option will be given to cancel or take a class at a discounted or adjusted rate. These classes are 55 minutes long and are composed of a combination of equipment. We keep our classes small, to insure we can give you individualized feedback to help you master technique at any level. This class is an effective full body cardio workout utilizing a new jumpboard called the Cardio Trampoline. This trampoline allows one to jump without putting any stress on the joints, or lower back. It’s a safe way to add cardio to your workout routine. Get ready to sweat! Click here to visit the schedule to book a class!